A 118.28 carat white diamond broke a world record Monday when it fetched more than $30 million at a Hong Kong auction. The sparkling Oval Cut translucent stone was sold to an unnamed phone bidder at the Sotheby’s auction for HK$238.68 million ($30.6 million) following bidding that lasted for more than six minutes, leaving auctioneers thrilled. “We are extremely thrilled,” Quek Chin Yeow, deputy chairman of Sotheby’s Asia, told reporters following the sale, describing the buyer only as a “private collector”. He said the sale signalled a “moving trend” for the southern Chinese city to host major global auctions. Hong Kong has become a centre for jewellery auctions thanks to growing wealth in China and other parts of the region. 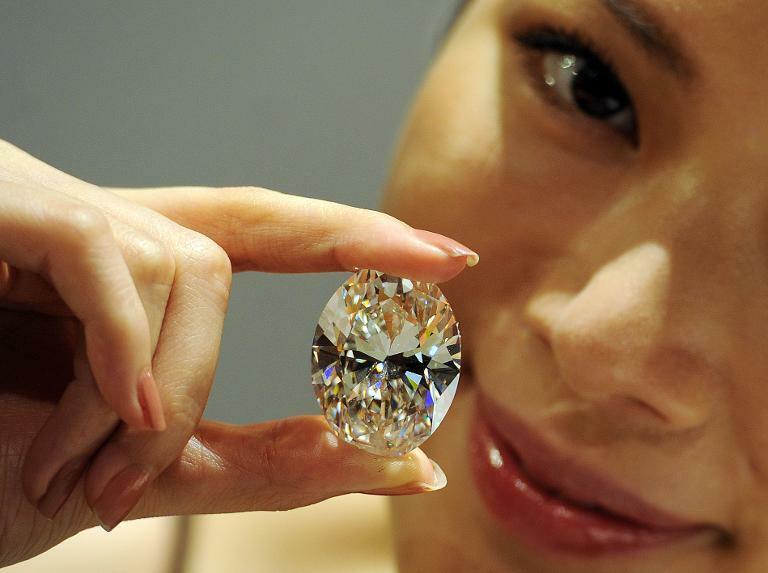 “The sale alone proves that we can actually sell major diamonds here in Hong Kong. It’s a moving trend,” he said. “The downturn everybody thinks is happening in Asia, or the slowdown… a lot of the collectors are still extremely wealthy individuals,” he said. The oval shaped stone sold Monday has been described as the finest of its kind ever to appear at auction. Earlier estimates valued it at $28-$35 million. The stone, dubbed the “Magnificent Oval Diamond”, was discovered in a deep mine in an undisclosed southern African country in 2011. As a rough stone before being cut, it weighed 299 carats. The stone, described by Sotheby’s as “the largest D colour flawless diamond” sold at auction, has been given the highest quality rating awarded by the Gemological Institute of America. “D colour” diamonds are rare and colourless and fetch premium prices. The sale beat the record set at a diamond auction last year, when a 101.73-carat diamond was sold for $26.7 million.